Want to increase the odds of keeping your New Year's resolutions? You've got the best intentions, now it's time to arm yourself with the best gear and accessories to increase the odds of sticking with your New Year's resolutions. If your goal is to get fit, organize your home, or do more entertaining, we've got the goods to start you on the path to success. Hike the San Andreas fault, operate a bulldozer, play poker with a pro. Cloud 9 Living helps you make your dreams become a reality. Learn about Cloud9 Living's experience gifts here. When you need to keep track of personal, work, and school plans that inevitably overlap, you need a day planner that multitasks as well as you do. Buy the BusyBodyBook family organizer here. Bring clarity to the number on the scale with the Escali Bath Scales. This tool not only measures your weight, but your body fat too. Buy the Escali bathroom body fat scale here. Why while away the workday when you can walk it away? With the TrekDesk treadmill desk, you can work at your PC and take calls while strolling along. Buy the TrekDesk treadmill desk here. Clean Food is more than just a cookbook, it's a guide to making healthy food choices that are good for you and the environment. Buy the Clean Food cookbook for healthy eating here. Jade Harmony mats are a step above the rest. Natural rubber works best where non-slip performance is crucial for safety. Harmony yoga mat no slip mat made with natural rubber. Powerful grip and better cushion and resilience. 3/16” thickness and made in USA. 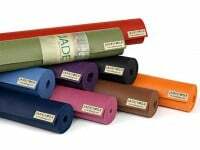 Buy the Jade Harmony Eco-friendly yoga mat here.